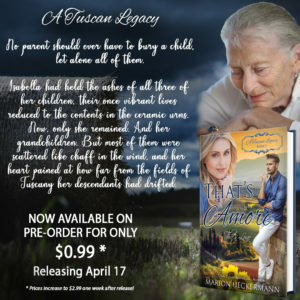 Here’s hoping you haven’t tired yet of hearing about A Tuscan Legacy. I guess with six of the seven authors in the series being Inspy authors, it’s inevitable that there are going to be a lot of blogs about this new series. 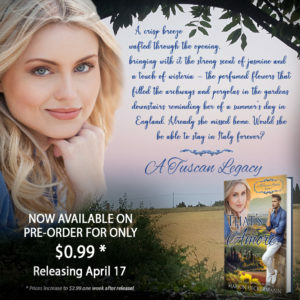 The success of the series isn’t just about writing great stories that will keep readers hooked from book 1 to book 9, it’s a lot about marketing too … getting the word out to readers about A Tuscan Legacy through blogs like this one, ads, giveaways, and Facebook parties to mention a few. And not forgetting using memes as a marketing tool. These are probably my favorite as they can be used in so many places. 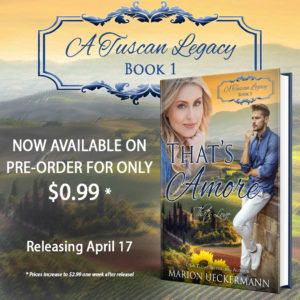 I created a couple of memes for the pre-order releases of That’s Amore (book 1) and Ti Amo (book 4), and I thought I’d share these with you today to enjoy. I’d love to hear from you which is your favorite and why. 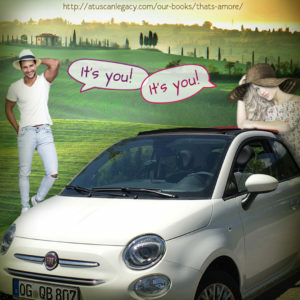 You could win the e-copy of Ti Amo that’s up for grabs. 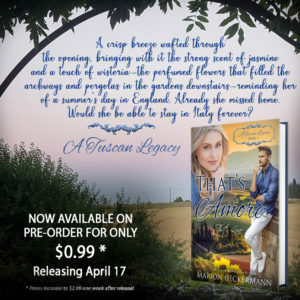 When Ti Amo went on pre-order, my Facebook, Instagram, and Twitter feeds were plastered with the following memes… As usual, I had a ton of fun with Alessa—she’s such a character! The day Alessandra Rossi was born, her mammà died, and a loveless life with the father who blamed the newborn for her mother’s death followed. With the help of her oldest brother, Rafaele, Alessa moved away from home the moment she finished school—just like her other siblings had. 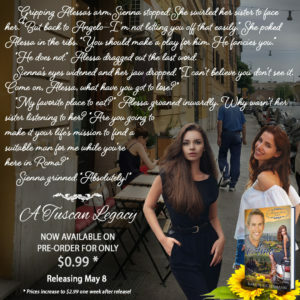 Now sporting a degree in architectural history and archaeology, Alessa loves her job as a tour guide in the city of Rome—a place where she never fails to draw the attention of men. Not that Alessa cares. Fearing that the man she weds would be anything like her recently deceased father has Alessa vowing to remain single. Can anything sway the beautiful and headstrong Italian to fall in love? Can anyone convince her to put her faith and hope in the Heavenly Father, despite being raised by an earthly one who never loved her? Will her sister’s prompting, or a mysterious painting, or Michael himself change Alessa’s mind? About love. And about God. “CIAO.” Alessa waved as she exited Ciacco & Bacco, her sister close behind her. She glanced up at the clusters of pink bougainvillea that stretched over the entire front façade of the sandwich shop—from the door to the window on the other side of a buttercup-colored wall. She glanced over her shoulder to see Sienna wave too. “He does not.” Alessa dragged out the last word. Skewing her mouth down on one side, Alessa gave a slight shrug. It did beat her sister trying to save her mortal soul. Alessa was about as interested in religion as she was in marriage. Where had God been when it mattered, when she’d hurt so as a little girl? This was going to be an interesting three days. “Then you need to get out more.” A smile teased Alessa’s lips. Sienna didn’t respond, and silence descended between them. Alessa soon returned toting two backpacks with the helmets inside. They made it easier to carry the head protectors around the city. She really did need to invest in a bauletto—the top box on the back carrier would make life simpler. But she always found she’d rather spend the money on shoes or designer jeans. One of these days perhaps. Alessa glanced at the white cotton off-shoulder top she’d changed into, the loose-fitting design far cooler than the T-shirt she’d worn earlier. Her gaze extended to the denim shorts she now sported. Hmm, she hadn’t even realized how tanned her legs had become in the time at the villa. “What’s wrong with this?” Alessa gestured toward her body. Alessa tugged her helmet from the backpack, and then pressed it onto her head, tucking her hair out of the way. She fastened the strap beneath her chin before securing both empty backpacks to the chrome luggage rack at the rear. “I know. It’s just—” Sienna cut off mid-sentence as she cinched her strap. She hopped on behind Alessa. 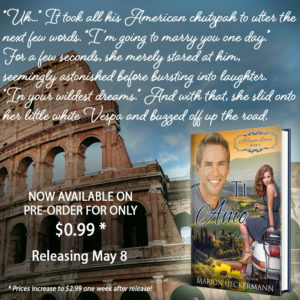 Soon the two sisters were buzzing through the busy streets of Rome, the Vespa zigzagging between cars. Don’t forget to let me know your favorite meme for a chance to win an e-copy of Ti Amo. Comment entries for this giveaway close on Saturday, May 5th. Hi Marion, thanks for sharing more about Alessa’s story, I am looking forward to it. Favourite meme- the Psst one. I think Alessa’s playful spunkiness comes out in it. You’re welcome. I just love Alessa. She’s been such a fun character to work with. Hi Marion! Thanks for sharing your talent not only as a writer, but as a promoter of this wonderful series. The release of each romance is the highlight of my week, because I can travel the world. I think me favorite meme is the one of Isabelle reflecting on both the past (the loss of her children) and the present (her scattered grandchildren). This meme captures the essence of the entire series. As a mother and grandmother, I immediately emotionally related with the opening quote; since several of my friends have had to bury their children. The descriptive and figurative language “scattered like chaff in the wind” / “her descendants had drifted” made me pause and think. Love the picture of Isabelle, just like I pictured an Italian Nonna in my mind. Best wishes. Nice story can’t wait to read it. I’m reading That’s Amore right now and looking forward to the entire series, such an interesting series concept. 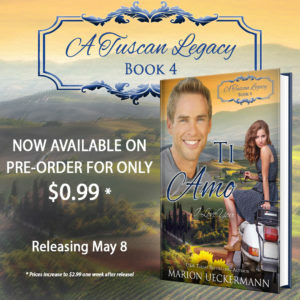 My favorite meme to promote Ti Amo is the one that says, “I’m going to marry you someday”, swoon-worthy right there! And Michael’s a missionary with a lot of confidence, in himself and God! This plot line is so good I kind of want to jump forward to it the minute it releases, I’m hoping to be caught up by then with all the stories! As a side note, I’m enjoying your vacation pictures on FB and living vicariously through you, My only trip I’ll ever take to New Zealand but it’s been great fun! As for the memes, I need to pick one out of 8 memes to share to our Inspy Romance Instagram account! Not an easy decision, lol. I loved working with Alessa and Sienna :) And boy, they do have a TON of fun in Rome! My favorite meme of Ti Amo is the 2nd one, with her hand at her mouth. I am so excited about reading this series, but I am trying to wait until they are all released,,,as for the memes I love the pssst one!! I’m really loving this series! I have a hard time waiting for the books to come on my kindle. I’ve pre-ordered all of them. As for the memes, I’m a bit picky. I feel for promotional aspects I’d say the ones you’ve already been posting with the pre-order on Facebook. The ones with the book cover and the date. Simple is often better because it draws us in with just enough to wet our interest. I do graphics for books, and I forgot to highlight quotes so maybe I’ll have to re-read the first two and find some quotes to use. I do like the Psst… one it is cute! This sounds like a wonderful story!! I like all the memes, but the cute one with the grandmother caught my attention the most. Can’t wait to read the story. I can’t wait to read this! My favorite memes are the pre-order ones. I think I like the one of Alessa in the pink top kind of looking at the book best, but the Psst one is fun too! Fun memes for a fun character :) Enjoy Ti Amo when you read it, Melynda! Thanks for the excerpt. I try not to read them because then I “have” to get the book but since I already know I’ll be reading all of these, it was safe! I am waiting until closer to when they’re all available to start them though. Regarding the memes, I think my favorite it the one where he says he’ll marry her someday. My second favorite is the psst one. Thanks for sharing. I love the meme with the “I am going to marry you one day” sentence. It gives me a glimpse into both his and hers personality. I’m looking forward to Ti Amo! You’re welcome, Priscila. Michael and Alessa are both wonderful characters. LOL! Gotta love those two girls! Marion, I loved your beatiful memes! Great job! You’re so multi-talented! I have enjoyed that build up to the series. I like the meme fot That’s Amore with the Grandmother looking down. Each character needs one of those! Thanx for the giveaway! Each week we’re so excited, Jennifer, when the next book in the series releases and we trust our readers are too. My one gran died just after I was born (I think), and the other when I was probably around 8. I’m striving to be that gran looking down over my two grandsons…it’s a wonderful season of life. Marion, your book is excellent, and all of these memes are great! I really like #5, with Nonna in it, because it captures the whole series. Thanks so much, Becky. Glad you enjoyed That’s Amore. All the memes are such fun! !